Few travel destinations beguile visitors more than remote Marrakesh, a fascinating desert city with a throbbing heartbeat. What defines Marrakesh in essence is Djamaa el Fna, the large main square. It's been called the world's most exciting and energetic gathering place. It's crowded and pulses. Local shoppers bargain for spices, fruits, vegetables and other staples while zealous tourists hunt for take-home Marrakesh gifts and souvenirs. Stall lights begin twinkling and Djamaa becomes the world's largest public party. The atmosphere becomes electric. Roaming musicians, acrobats, jugglers, fire-eaters and other entertainers troll the appreciative crowds for coins. And the sweet-spicy scents of local Marrakesh dishes cooking in carts and nearby eateries beckon the hungry. The city's famous souq (marketplace) abuts Djamaa square. Stalls lining its narrow alleys offer carpets, leather goods and other local Marrakesh craft specialties. 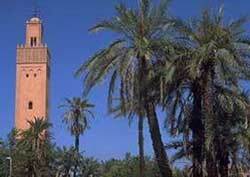 The elegant 70-meter (230-foot) high Koutoubia minaret (see photo) is also close by. It is Marrakesh's primary landmark and is over 800 years young.